The Samsung NX1 hybrid camera offers a 28.3Mp APS-C BSI CMOS sensor in a D-SLR style magnesium alloy shell with large handgrip and top-plate LCD for improved handling. Samsung really want to push the boundaries of the hybrid camera category with the launch of the new Samsung NX1, which they claim offers cutting edge design and industry-leading camera technologies. With some specs that will catch the attention of pro shooters fed up of lugging huge and heavy cameras around, the Samsung NX1 does on the face of it appear to tick all the right boxes. For instance the DSLR styling with a decent handgrip and optional vertical handgrip should offer better handling and increased battery life over most hybrid cameras. The build is a magnesium alloy body too, so should be capable of withstanding bumps and it’s the first hybrid camera to feature a top-plate LCD screen for ease of use. Whilst not the highest resolution hybrid available, a title currently held by the 36.3Mp Sony A7R, the Samsung NX1’s 28.2Mp offers more pixels than most. Sticking with APS-C the new NX1 features a 28.3Mp APS-C BSI CMOS sensor that Samsung claims offers a lower signal to noise ratio than a conventional CMOS sensor, for better low-light performance. We’ll see how effective that is when we put the NX1 through our sensor tests in the coming weeks. If Samsung are targeting the NX1 at serious enthusiasts or even pro shooters however, deciding to use the smaller APS-C sensor, instead of designing the NX1 around a full frame sensor, might put off those looking for the best image quality available. It’s difficult to fault the rest of the specs though with an ISO 100-25,600 (51,200 expandable) sensitivity range, and new processing technologies that Samsung claim reduce Noise without suppressing fine image details. For burst shooting the new Samsung NX1 crunches through 15fps with full autofocus from the new 205-point Phase Detect autofocus system. That’s an awful lot of Phase Detect AF points, and placed across the frame Samsung claim the AF system offers almost edge-to-edge autofocus and seamless focus tracking capabilities. The Electronic Viewfinder (EVF) is the XGA OLED variety featuring a 2.4m-dot resolution, whilst the 3.0in 1.04m-dot Super AMOLED LCD screen offers touch screen functionality and can be tilted up 90 degrees or down 45 degrees. For video the Samsung NX1 captures full 4K movies at 24fps (4096x2160px), UHD at 30fps (3840x2160px), or full HD at 60/30/24 fps (1920x1080px). Impressively the NX1 can also recorded full 4K video direct to SD card, so there’s no need for external recording equipment to be connected. 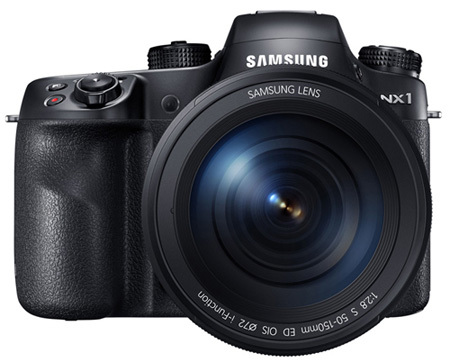 Announced alongside the Samsung NX1 is a new ‘fast’ super telephoto zoom lens for sports and wildlife. The new NX 50-150mm f/2.8 S ED OIS lens offers an equivalent 77-231mm focal length, fixed f/2.8 maximum aperture and up to 4.5 stop image stabilisation. This will be a welcome addition to the NX lens range for any serious enthusiast or pro photographers thinking of taking the Samsung hybrid plunge, and lines up alongside other ‘pro’ grade NX lenses such as the NX 16-50mm f/2-f/2.8 ‘fast’ standard zoom, NX 60mm f/2.8 macro, NX 85mm f1.4.